This is a 4 bed 3 bath home with a lake view from the pool deck. 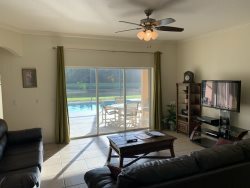 It is in the highly desirable community of Cumbrian lakes with its gated entry and country like setting only a short drive from Disney. The home is tastefully decorated throughout and features a lot of blue and white going from counter tops to bedding. It is carpeted and has large comfortable sofas in the living area. The kitchen is fully equipped and the home has its own washer and dryer. There are two glass dining table giving seating for 10 people. All the bedroom sets are white. There is a King Master leading to a large bathroom with tub and walk in shower. The second bedroom is located beside the second full bathroom and has a queen sized bed. 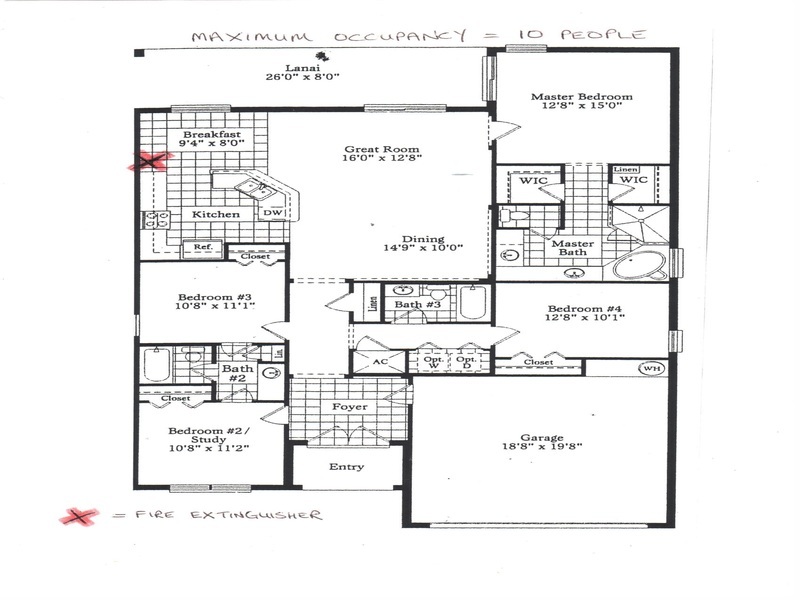 The other two bedrooms have twin beds and share the homes Jack and Jill bathroom. A super floor plan for a family vacation when the grandparents come along! I highly recommend this house. Over all clean and neat. Perfect for two families to share and have a nice time at the Pool. I also recommend to get the Pool heated, the kids dont mind but is adults did. Thanks a ton Annette. We will staying again on our next trip. We had our first family reunion trip to FL last week and stayed at Cumbrian Lakes 58. We were more than pleased with the house which was very clean and cozy for the eight of us, including 3 seniors and 2 young kids. It was a convenient drive to the theme parks. My father was on wheelchair and the house was easy access for the wheel chair in and out. Thanks to Annette for her prompt responses for all the questions we had prior to the trip as well as during the trip. We would love to recommend this property to anyone!